The Department of Education encourages educational technology developers to take the needs of English learners and their educators into consideration in their technology design. As of the 2015–16 school year, there were over five million English learners, about 10 percent of all K–12 students. Many teachers, including those in small and rural districts, instruct one or more English learners—or soon will. Teachers often use technology designed for general education students when instructing their students who are English learners, so any educational technology you design will likely be used by English learners. The types of professional development and training activities that educators find most valuable. This toolkit and a companion Educator’s Toolkit are based on insights from the findings of the National Study of English Learners and Digital Learning Resources conducted by the U.S. Department of Education, Policy and Program Studies Service, on behalf of the Office of English Language Acquisition and the Office of Educational Technology. Both toolkits focus on software or “digital learning resources,” that is, the apps, programs, or websites that engage students in learning activities and support students’ learning goals. The toolkits do not focus on hardware (e.g., laptops, computers, tablets, or other devices), although you may find that some insights are applicable to the design and use of hardware devices.The study provides the first national data on how educators across the country are using educational technology in instructing English learners. The study conducted surveys, case studies, and meetings with experts in the field, including educational technology publishers, researchers, and educators. To learn more about the study and the toolkits, you can read a brief description on page 20. The study’s final report describes how districts and teachers identify and use technology in instructing English learners, as well as related supports and barriers. 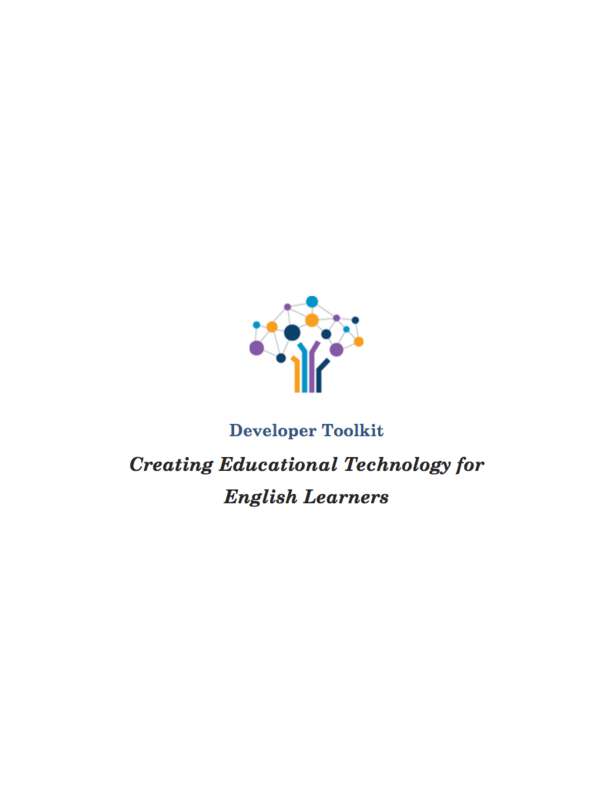 This toolkit builds awareness of the role technology can play for English learners and notes areas where technology developers can improve their offerings for English learners, based on needs suggested by the study. The design of educational technology, especially for students who are English learners, requires designing for a diversity of educators, students, and instructional needs. Educators have differing roles but share responsibility for their students’ success in learning both language and academic content. English learners have a wide range of backgrounds and use educational technology for a variety of instructional tasks. By identifying the needs of educators and students, you will be able to develop and design more effective products. District administrators and/or school technology coordinators who recommend and support educational technology use. Have disabilities, and some may require the use of assistive technology, including software to support their accessibility needs. Materials that fit the needs of older beginner English learners while providing grade-level content and design that is appropriate for them as middle and high school students (i.e., not childish or simplistic in their activities and images). Digital Academic Content Tools, which offer academic content resources and/or engage students in activities to learn academic content or skills. Digital Productivity Tools, which offer resources to plan, document, organize, and analyze content. They do not contain academic content. Digital Communication Tools, which offer resources to communicate, collaborate, network, or share information. They do not contain academic content. Identify your customers. Who are the educators and English learners who will use and evaluate your product? What are their characteristics and needs? Partner with teachers, schools, or districts to find design partners. Involve target users in design to better understand their needs in serving English learners and possible solutions to meet those needs. These partners should be chosen carefully, as different feedback may be provided by teachers who actively integrate new forms of technology into their instruction as compared with teachers who are less comfortable with using technology in instruction. Develop a set of scenarios (or “personas” or “use cases”) to describe your users and their needs. The scenarios below describe common situations for English learners and their teachers, highlighting their needs. An understanding of customer needs can be used as the basis for developing products. You can take these as a starting point but should develop your own based on the specifics of your technology and customer. By creating partnerships with districts or schools, you can create your own scenarios and learn how your materials can be improved to better meet the needs of your customers. Maria is a middle school English learner who excelled in school in her country of origin and is at grade level in math and science achievement. She needs to learn new mathematics concepts, such as the relationship between slope and unit rate, while learning how to speak, read, and write English. Her math teacher is working with her English learner specialist, Mr. Kenny, to find ways to help Maria keep pace in her math learning as a beginning level English learner. Mr. Kenny noted that Maria may benefit from interactive visual representations such as a mathematics-specific, digital academic content tool that offers dynamic graphs and motion simulations. These can help Maria learn the concepts, and the needed vocabulary can be introduced through features directly related to the visual representations. In addition, Maria can manipulate the representations to communicate her own ideas, allowing a richer form of communication than possible when using spoken or written English. Malika is a high school student in Mr. Reilly’s social studies class. She is a long-term English learner who is reading several levels below her grade. The class has been assigned a reading on the emergence of the industrial society, and Mr. Reilly has identified an alternate digital academic content resource for Malika that offers sets of texts on the topics they are studying, written at her fourth-grade reading level. Malika finds the resource child-like, both in content and in visual format, and is embarrassed to be using it. Mr. Reilly is frustrated that the resource does not address grade-level standards about this topic. Malika may benefit from tools that offer simpler versions of the English language text on the same grade-level content and include multimodal support features such as visual representations for understanding the academic terms and vocabulary. A resource that maintains a high school look-and-feel, while addressing high school standards, can better meet the needs of Malika and Mr. Reilly. This resource can also provide markup tools that allow Malika to make notes and possibly even submit assignments in a way that allows Malika to build academic English skills while learning the content. Josef is an elementary school student in Ms. Lee’s class, where they are studying plant structures. He is learning English and has missed two years of formal education due to years spent in a refugee camp, but he is eager to learn and work with others. Ms. Lee wants to be sure that Josef can collaborate with his peers as they learn about plant structures for reproduction and how these structures function. She also wants Josef to be able to contribute as the students put together group presentations to show what they’ve learned. Josef may benefit from working with a digital storytelling or other template provided by a productivity tool as he learns about plant structures and contributes to the group project. This template can include ways for Josef to pull in images to convey key information. Josef may also benefit from a video-creation productivity tool that will allow him to review and revise his statements to the group (e.g., recording, replaying, and revising his statements before sharing them with others). These tools can allow Josef to engage with others and contribute to the group presentation. How do my current and target customers describe their roles and needs? What do my customers report as the current contexts of use for my tool, how can they be supported in these different contexts, and what other contexts would they like to see supported? What educator roles, student roles, and instructional context should I use to create a set of scenarios that can help me better understand my customers and how to support them? For general advice on developing educational technology, see the Ed Tech Developer’s Guide. For an outline of educational technology categories and types, see the Digital Learning Resources Matrix. This matrix was used in the study as a summary overview of the types of resources available to educators. When designing and refining educational technology, decisions should be consistent with best practices relevant to your specific educational technology product. The Department of Education encourages developers to familiarize themselves with the research on instructional practices that help English learners gain proficiency in English and build understanding in the different content areas. Understand what is known about promising and effective practices for instructing English A recent summary of what we know from the research, Promoting the Educational Success of Children and Youth Learning English: Promising Futures, was developed by a committee of experts in the field. It includes an overview of instructional practices for English learners in grades Pre-K to 12, and is a free resource as a pdf. The National Clearinghouse for English Language Acquisition (NCELA) is another resource. NCELA collects, coordinates, and shares a broad range of research and resources in support of high-quality education for English learners and includes a resource library. The Universal Design for Learning (UDL) framework provides guidelines to improve and optimize teaching and learning for all people based on scientific insights into how humans learn. The guidelines were initially developed as a way to design technology for students with a wide variety of learning needs, including needs related to a student’s disability, and many of the guidelines may be particularly effective for English learners, including English learners with disabilities. UDL is based on the premise that all students benefit when provided flexible learning environments that can accommodate individual learning differences. These guidelines recommend providing: multiple means of engagement; multiple means of representation; and multiple means of action and expression. For example, technology that enables students to engage with content through auditory modes as well as visual modes can help many to learn new content. English learners can benefit from hearing text read to them when they are not yet fluent readers, and students with impaired vision can also benefit from a text-to-speech option in learning new material. Base decisions on research. Use the research on effective and promising practices for English learners to guide the design of your specific educational technology resource so that it can engage and support the English learners who work with your product. Use existing guidelines relevant to your educational technology design. Refer to frameworks such as UDL and others so that your product design is informed by what is currently known about research and best practices relevant to educational materials design generally and to technology solutions specifically. Create designs that specifically address the users you have identified and their needs. For example, ensure that the product design elements reflect promising practices that are appropriate to your targeted English learner students’ age, accessibility and/or disability related needs, and/or grade level. Inform sales and marketing of the research you are integrating into your product. When you leverage research, let others in your product group know. Educators often will want to know the research basis of the resources they are considering. Make sure that your sales and marketing teams are aware of how your product is based on research, and how it meets the needs of your target customers. What is the research on promising and effective practices that most aligns with my product and will my product lead to strong solutions for the specific English learners and contexts we’re targeting? What are the changes I can make to my product that can better align it with best practices according to existing research and design guidelines? The Universal Design for Learning (UDL) framework is widely used, and districts may request or require that technology providers show how UDL was used in the design of their product. For more on the design and development of educational technology resources generally, see the U.S. Department of Education, Reimagining the Role of Technology in Education: 2017 National Education Technology Plan Update. Note the discussion of Universal Design to meet the needs of all students including students with disabilities on pages 21-23. The website for the Promoting the Educational Success of Children and Youth Learning English: Promising Futures includes additional resources, such as blogposts and webinars on several key topics. Scroll down to the list of “Resources at a Glance” to view the offerings. There is also an Online Toolkit – Promoting the Educational Success of Children and Youth Learning English. In this resource, the National Academies of Sciences, Engineering, and Medicine provide additional information related to the committee’s report, including short videos from experts. The National Clearinghouse for English Language Acquisition (NCELA), publishes NCELA Nexus, a semimonthly e-newsletter, to share new resources, upcoming events, and other announcements. It provides links to opportunities for jobs, education, and funding related to the education of English learners. Nexus subscribers may also receive occasional, time-sensitive announcements from the U.S. Department of Education’s Office of English Language Acquisition and NCELA. Educational technologies can support learners in ways that go well beyond digitizing textbooks and worksheets. By embedding well-considered supports for English learners, your educational technology may stand out in the marketplace. The field has identified several types of embedded supports that are applicable to different technologies and use cases. See a list of categories and types of supports identified thus far in the Digital Support Features Matrix. The list of digital support features is meant to provide inspiration. As you dive deeply into your own technology, users, and product design framework, you may identify new innovative features that can better serve all English learners, including those with disabilities, and other students. Developing software with text embedded in the code or with text embedded in images will make it very hard to provide many of the supports that are known to be effective for English learners. All user-facing text (including text associated with controls and images) should be in external resources that can be modified without modifying your code base. This will make it easier to add new languages to support a broader range of English learners. Provide visual supports. Visual support can take many forms, from providing simple images to sophisticated interactive visual displays. Different levels of visual support can be used depending on student needs, and traditional text can be faded in as students become more fluent. Visual supports can also be used to aid students in expressing themselves, for instance, by allowing them to use visualizations in addition to, or instead of, using text. Increase access to content through interactive representations. Interactive graphics can engage students in scientific experimentation and simulations. Dynamic mathematics environments can allow students to interact directly with mathematical objects without the need for textual mediation. Social studies timelines and graphic displays can provide insights without the need for extensive text interpretation. By tracking student interaction with these representations, technology developers can better capture what students know and also provide students with a mode of communication other than traditional text. Provide audio supports. Text-to-speech or “read-aloud” supports are valuable because many English learners can comprehend the spoken word better than the written word. For many students, the combination of spoken and written words is particularly useful. In addition, technology can allow students to modify the speed at which speech plays, allowing for students to play text at a speed comfortable to them. Audio can also provide spoken translation or an audio clip of a sound that helps explain a vocabulary word or a phrase. Developers should be aware of the capabilities built into the hardware or operating system they are running. They should ensure that their technology can take advantage of these capabilities and/or be interoperable with supports enabled by assistive hardware a student might use. Provide written text support. Text support can include the ability for students to highlight, mark up, and annotate text. This can be used to scaffold understanding, as well as to allow students to demonstrate what they know. Expand the languages your product supports. While a wide variety of materials is available in Spanish, English learners come from many language backgrounds other than Spanish and can benefit from supports in their home language. For example, Arabic, Chinese, and Vietnamese are the next most common language backgrounds of English learners in public schools in the United States. The major English learner groups can be very different within an individual state or school district, so developers should determine the language backgrounds of English learners in their target schools and districts. Supporting languages beyond Spanish can open the marketplace to new schools and districts. Teachers and students can benefit from the broader range of supports for classroom instruction, and students may be able to receive additional support at home. Allow students of all reading levels access to grade-level content. Educational technology can provide simpler text in reading passages and introduce grade-level vocabulary just-in-time and in a way that relates to the specific content and context of the passages. This can provide English learners who are not reading at grade level access to grade-level social studies, science, or math content. Allow students multiple modes of expression. To communicate in the different content areas, students must not only experience language generated by others but also have opportunities to produce language. The ability for students to record and play back their voices, possibly with guidance on how they could improve their language or pronunciation, is a common teacher request. Recording and playing back the sound gives English learners opportunities to practice and listen to their own speaking while being supported in a nonjudgmental manner. Provide support for collaboration. Providing opportunities for joint student work and discussion is an increasingly important part of academic content standards. For English learners, peer interactions also are opportunities to use language in meaningful ways and to make gains in English language proficiency. Teachers are looking to educational technology to provide supports for student-student and student-teacher collaboration. Ensure that all supports are also accessible to and usable by students with disabilities. Also, keep in mind that your supports should be interoperable with any assistive technology that students with disabilities may be using. How is my product used, and what supports can enhance that use for English learners? Are there supports listed in the Digital Support Features Matrix that I can directly apply to my product? Have I considered the need for general accessibility features in the design of the product? How can I go beyond the digital support features listed in this toolkit when creating supports for English learners? For a matrix that identifies an initial set of categories and types of support features, see the Digital Support Features Matrix. Developers should communicate how the use of their technology can have a positive impact on instruction, how the features found in their educational technology are beneficial to the instruction of English learners, how the educational technology is based on research, and what appropriate implementation looks like. When determining what educational technology to use, many educators look for independent evidence of effectiveness, as well as an indication that specific features are based on the research literature. Educators typically find recommendations for technology use from a wide variety of sources, and they oftentimes value the opinions of other educators in making decisions about educational technology. Many teachers are too busy to fully analyze all the software they use, and so they often don’t know what support features are available in their technology resources. They may occasionally ask for a feature to support their English learners that is already present in a resource (a clear indication that you are not appropriately communicating your feature set to your customers). While educators want to monitor individual student progress, they also have privacy concerns and want a better understanding of how student information is being protected. Communicate the evidence base for your technology. If evidence for the effectiveness of your technology exists, make it clear to educators and administrators. If it does not exist, consider options for generating such evidence, such as partnering with school districts, a university, or an independent research organization. Ensure that you understand and support the district review and purchasing process. Districts have different purchasing requirements, and some have funding sources specifically for technology or for resources for English learners or students with disabilities. Investigate the different sources that schools and districts can use to purchase your resources, understand the approval process, and make it as easy as possible for educators to prepare required documentation. Listen to what educators are saying. Talk directly to a sample of educators, and look for product reviews written by educators. Authentic, honest input is invaluable in the product development and improvement process. Review current or previous district requests for proposals. Districts, especially large districts, often make clear what their current English language support requirements are in formal requests for proposals (RFPs). Even if you are not responding to a district RFP, reviewing a set of recent RFPs can provide insight into current district expectations and terminology. Ensure that educators and students can readily find and use your embedded support features. If your product’s feature set is not easily discoverable or easy to use, educators may turn to alternative products whose features are more obvious and accessible. User tests with educators can provide information about how they find and describe your features. Make your embedded support features publicly known. Ensure that your website and other materials clearly describe the accessibility and support features you’ve included in your product, and inform your sales and marketing team of these support features. Administrators and teachers will look for these when considering what technology to use. Ensure that your product adequately protects student data. Review your product’s operation to make sure that you only collect data that are required to achieve the sought-after benefits, and that there are strong protections in place for these data. The Future of Privacy Forum and the Software & Information Industry Association (SIIA) have introduced a student privacy pledge that is a good starting place for thinking about student privacy. The U.S. Department of Education has a website describing best practices for protecting student privacy, has a site that includes confidentiality provisions for children with disabilities under the Individuals with Disabilities Education Act (IDEA), and has created the Privacy Technical Assistance Center (PTAC). Does my product information clearly communicate the evidence that demonstrates its effectiveness with particular groups of students and particularly English learners? Do I know the purchasing requirements and processes of my target customers? Is there publicly available information, such as RFPs, that I can review to gain insight into current purchasing requirements? Are there common sets of feature descriptions that I (and other developers or publishers) can provide to educators to simplify the district review processes for them? Before naming a feature or type of support, have I looked at other products to determine if there is already a name that is commonly in use? How can I work with others in the field, such as education technology associations, to provide a common language for the embedded supports provided in products? Could we communicate these more clearly with educators and other stakeholders that are looking to support English learners? Do I provide clear and simple explanations of the student data the product collects, and of how these data are protected? Teachers reported that vendor-provided professional development often did not meet their needs. Existing professional development often focuses on how to use technology features, but many teachers want to know how the features and content can improve their classroom instruction in meeting the needs of their English learners. Many technology providers have a training model in which they train teachers how to use product features. However, teachers want to use educational technology to improve their classroom practice, and they do not want a “how to” guide that only describes product features. To truly improve teacher practice, ongoing professional development is required. However, teachers have limited time and budget, and so they may be looking for non-traditional forms of professional development. These may include embedded video clips showing classroom examples of effective technology use to support English learners, short online modules, or online communities where they can share their successes and difficulties. Gather teacher input on your professional development and training. Teachers are the best judge of the usefulness of professional development sessions. Have teachers help design and deliver your professional development whenever possible. Teachers find professional development sessions run by educators to be most effective, especially when the sessions focus on ways that technology can improve their practice. Have varied forms of professional development materials available, including embedded professional development. Teachers are looking for video and other embedded resources to give them a better understanding of how classroom use of the technology can support their English learners. Provide opportunities for teachers to learn from each other. Teachers want to learn from other teachers, so consider structuring community forums or other collaborative spaces that enable teachers to share successes and difficulties with one another. Once teachers have completed our professional development courses, can they immediately apply what they have learned to their classroom instruction? Does the professional development associated with my product make clear the improvement in instruction for English learners that will come from its use? Do I provide follow-up professional development that allows teachers to come back and ask questions about their classroom experiences in using my technology with English learners? The National Study of English Learners and Digital Learning Resources is a national descriptive study conducted in the 2016–17 school year by the U.S. Department of Education, Policy and Program Studies Service, on behalf of the Office of English Language Acquisition and the Office of Educational Technology under contract number ED-PEP-11-O-0088/TO27. The study included a nationally representative survey of districts, a survey of teachers, and six case studies, and meetings with experts to examine what digital learning resources are used in instructing English learners and how they are used. The study provided findings that describe the use of digital learning resources in instructing English learners in grades K–12 in U.S. public schools. The study provided descriptive data to identify current uses of digital learning resources, needs for additional information and/or supports in their uses, professional development on use of technology in instructing English learners, and areas in which educators wished to see improvements in the digital learning resources available to them for instructing English learners. The full study report will be posted to the Department’s website at: http://www2.ed.gov/about/offices/list/opepd/ppss/reports.html. This document contains examples and resource materials that are provided for the user’s convenience. The inclusion of any material is not intended to reflect its importance, nor is it intended to endorse any views expressed, or products or services offered. These materials may contain the views and recommendations of various subject matter experts as well as hypertext links, contact addresses, and websites to information created and maintained by other public and private organizations. The opinions expressed in any of these materials do not necessarily reflect the positions or policies of the U.S. Department of Education. The U.S. Department of Education does not control or guarantee the accuracy, relevance, timeliness, or completeness of any outside information included in these materials. Mentions of specific programs or products in these examples are designed to provide clearer understanding and are not meant as endorsements.